Will Vaulks pulled on a Wales shirt and thought of his two Welsh relatives who were killed in the First World War. The long-time family post office, in the north Wales town of Ruthin, also came to mind, as did the sight of his grandfather singing Land of My Fathers. Vaulks, the Rotherham United midfielder who has been given an international chance by Ryan Giggs, was born and raised in England. But having grown up within sight of Wales on the Wirral, Vaulks has "always been proud" of his Welshness. He won his first two caps in the victories over Trinidad and Tobago and Slovakia last month. A couple of weeks later, he was recognised for the voluntary work he does at a children's hospice in South Yorkshire at the EFL Awards. At club level, meantime, there is a relegation scrap to fight, with Rotherham in Championship action at Swansea City on Good Friday. Vaulks hopes this trip to Wales will prove as enjoyable as his last. The 25-year-old has an English father, Gary, but qualifies to play for Wales thanks to mother Ruth, who was born in Bangor. "The family ran the post office in Ruthin for generations and then eventually, when my mum was about eight or nine, they moved over to Ellesmere Port on the Wirral," he explains. "I grew up on the Wirral, but I could see Wales from my house - just across the estuary. "I have always been aware and I'm proud of both sides of my family. "My grandma and granddad were very proud to be Welsh - they spoke fluent Welsh. "I always remember them watching every sporting event involving Wales - mainly the rugby - and granddad singing the anthem." Vaulks was aware that Giggs had been spotted at a Rotherham game, yet it was still something of a shock when the Wales call came. Vaulks had been on the international radar around a decade ago, playing in a north Wales v south Wales game, but a subsequent get-together was rained off and he heard nothing more until Giggs' number appeared on his mobile. "I was quite emotional when I got called up," he says. "My grandma and grandad are no longer with us. I know that especially for my granddad, (getting the Wales call) is the proudest I could possibly have made him. "He would come and watch me and he was very proud to be Welsh. It means a lot more to me than people would imagine. "We have looked into my family history over the years. On Remembrance Day I always have a look because two of my granddad's uncles were killed in World War I. "The only reason I am here is because one brother, my granddad's father, had to stay and look after the post office. "I think as the oldest brother he was given a pardon which meant he didn't go to war. "Both his brothers died, one of them about three weeks before the end of the war. "My mum still has their briefcase, and my grandfather was named Hywel after one of the brothers who died in the war. I have always been aware of that." 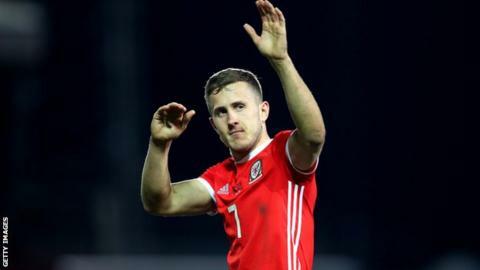 Vaulks played the full 90 minutes - and claimed an assist - as Giggs' Wales beat Trinidad and Tobago in Wrexham. His competitive bow followed four days later when he arrived as a late substitute in the Euro 2020 qualifying victory over Slovakia. "My aim was to try to enjoy the experience, maybe prove I could play at that level and offer the manager something he didn't have already," Vaulks says. "I have had a taste for it and now I want more. Whenever I have been given little chances in my career, I have tried to grasp them and see how far I could go. That's what I am going to do now." Vaulks' senior career began at Tranmere Rovers, but he left Prenton Park without making a senior appearance in 2012. He was handed a chance by Scottish second-tier club Falkirk and three years and more than 130 appearances later, he joined Rotherham for an undisclosed fee. The Millers suffered relegation in Vaulks' first season at the club but made an instant return to the second tier last term. Vaulks has been a regular throughout his time at Rotherham, racking up 134 games to date. "After leaving Tranmere I had to go and fight for it - I never gave up," he says. "I am now looking forward to the rest of my career to see where else I can go." The immediate target is to secure Rotherham's place in the second tier, while there should be another opportunity with Wales when they face Croatia and Hungary in June. Between the commitments with club and country, Vaulks has a weekly appointment at the Bluebell Wood Children's Hospice. "On a Thursday after training I go and spend three or four hours with the kids or their families, or maybe just doing some admin or fundraiser work," he says. "I have spent time with siblings who may have lost their brother or sister or are going through that process. "I just go in and say do you want to play football, Xbox or on the trampoline - whatever they want to do to take their mind off what's going on for a couple of hours. "When you do something like that and then get back in your car, you think: 'I have actually done something there that's helped and brightened someone else's day'." Vaulks has followed in the footsteps of his mother, who "did a lot of volunteering" when he was growing up. Off the pitch, just like on it, he has been inspired by his family.